Since entering my 30's, I have been trying to be more vigilant with the level of toxic chemicals I am putting in and on my body. This has become an expensive struggle, constantly trying more and more organic and natural products, all in the effort to minimize what I am consuming. I have a history of cancer in my family, and considering I have had 2 growths removed from my body by age 31, I am hyper-sensitive at this point. I know there are genetics that I cannot avoid when it comes to the big C word, but I am determined to do what I can to prevent any other ways it can infiltrate my body. When it comes to beauty products, it gets expensive. And frustrating. Much like other products, natural and organic beauty products do not stand up to the quality of others- those tested on animals, those with harmful and toxic ingredients in them. This is beyond frustrating, considering the ticket price on these items can be twice, if not three to four times the price. Enter BeautyCounter. I found this brand thru my PopSugar subscription over a year ago in my monthly MustHave box. Only upon researching it to repurchase did I find out it is a direct sales company- not that it's a bad thing, just figured I'd point that out. Once I found that out, I reached out to my friend Andrea of Howe We Live to talk more about their products. Before I dive into the benefits and details of the products, let me chat with you about BeautyCounter's mission and goals. This is an amazing company, and the more I read and learn about them, the more I'm intrigued and motivated to support them. From what Beauty Counter states on their websites and promotions, there have been no federal laws passed in the United States to regulate ingredients in personal care products since 1938. OMG WTH, right? Upon doing a little research for this post, I found countless studies conducted over the years of the harmful effects toxic chemicals we imbibe, inhale, or topically apply to our bodies are doing to us- there are rises in infertility, cancer, asthma, and other ailments as a result of it. This terrifies me and keeps me up at night, hence the efforts I take to limit reduced fat, fat free, formaldehyde, etc in products. Take time from your day and watch the first 2 minutes of this video- you'll be hooked too. 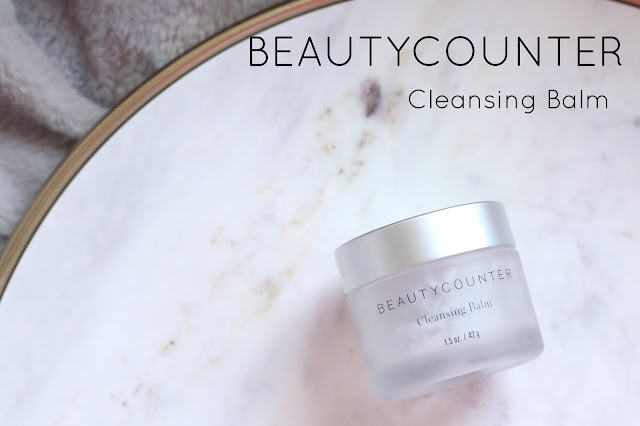 You can watch longer than 2 minutes, but the first 2 minutes are the meat of what BeautyCounter promotes. The consistency of this product is that of coconut oil at room temperature, melting slightly when you rub it between your fingers. When you apply it, you are to rub it in, melting it more with your body temperature. Applied directly on dry skin and without water, this gives a refreshing, moisturizing feeling as you gently massage into your forehead, cheeks and eyebrows. The balm comes with a muslin cleaning cloth which you wet with as hot a temperature of water that you can stand to wipe off, followed by a wiping down with the same cloth in cold water. The hot water will open up your pores, while the cold will close them ones they are cleaned and have soaked up the nutrients in this balm. As you can see, my PopSugar container is an empty- I replaced this about a month ago thru BeautyCounter's website. The cost is a little steep at $80 for 2.75oz, but this container will probably last me at least a year. I only use this to wash off my makeup which I wear about 1-2 times a week, and maybe an additional time during the week. So twice a week makes 104 times a year, at an almond size application, I'm thinking at least a year, right? They recommend using it nightly, but I have other rosacea products I prefer to use. Speaking of rosacea, this IS friendly for those of us rosey-cheeked girls as well as sensitive skin. Of course I am not a dermatologist and not speak to your individual needs, but as someone who suffers from redness from rosacea, this product does not irritate those issues at all. Have you tried any BeautyCounter products? Any you think I should try?